Mall spokesperson said previously evacuated stores have now reopened and are safe to visit. Several shops in the Secunda Mall were evacuated on Monday morning due to safety measures, reports Ridge Times. 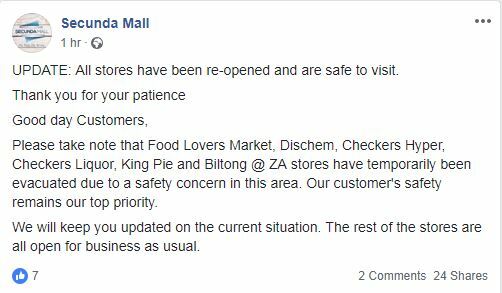 Jani Muller, the spokesperson for the mall, said Food Lovers Market, Dischem, Checkers Hyper, Checkers Liquor, King Pie and Biltong@ZA were temporarily evacuated due to a safety concern in the area. The mall did not divulge the nature of the safety concern. Police urged people to remain calm and follow the instructions from the mall’s management. Reports on social media indicate that the closed shops have now been reopened.